Hello and good day photographermarbella. I am sorry to know that you are having this issue with your DJI drone. 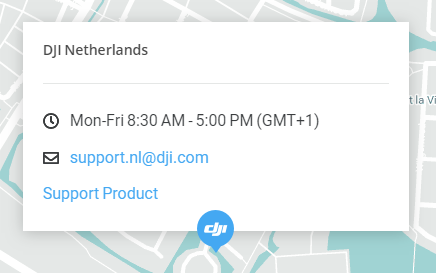 You may contact our support center in Netherlands by sending an email at support.nl@dji.com. Thank you. Thank you Stephen. I have sent them an email asking if they can locate my drone and send it back. The link (https://www.dji.com/service/repair/centers) recommends Stockrc fvp aeromodelismo, C/ Monaco 31, 28232 Las Rozas (Pol.Europolis), Madrid- Spain however they have been extremely unhelpful and quite unprofessional and I would suggest removing them from you list. Further if you don&apos;t intend to support or have any responsibility for these recommended companies I think you should remove all of them as this seems to wash your hands of all responsibility should anything untoward happen. DJI has its own method of returning a drone, I now know, and maybe this should be the only method recommended by yourselves. Thank you for the given update photographermarbella. Please keep us posted on the said situation for us to help you further. Thank you for choosing and believing in DJI. I&apos;ve been in contact with Support7.NL (DJI Support, do you know if they are actually based in Europe at all?